For laws regarding U.S. citizenship, see United States nationality law. For U.S. citizenship (birthright and naturalized), see Citizenship of the United States. Birthright citizenship in the United States is acquired by virtue of the circumstances of birth. It contrasts with citizenship acquired in other ways, for example by naturalization. Pursuant to the Fourteenth Amendment to the United States Constitution and the Immigration and Nationality Act (INA), U.S. citizenship is automatically granted to any person born within and subject to the jurisdiction of the United States (known as jus soli). This includes the territories of Puerto Rico, the Marianas ( Guam and the Northern Mariana Islands), and the U.S. Virgin Islands. Birthright citizenship also applies to children born elsewhere in the world to U.S. citizens (with certain exceptions), known as jus sanguinis. 1.1 Statute, by birth within U.S. Citizenship in the United States is a matter of federal law, governed by the United States Constitution. Statute, by birth within U.S.
A child born to parents who are not citizens of the United States in American Samoa is not a U.S. citizen, but is a United States National. Under certain circumstances, children may acquire U.S. citizenship from their parents. The Naturalization Act of 1790 provided for birthright citizenship for children born out of U.S. jurisdiction to two citizen parents. The Naturalization Act of 1795, which increased the period of required residence from two to five years, introduced the Declaration of Intention requirement, or "first papers", which created a two-step naturalization process, and omitted the term "natural born". The Act specified that naturalized citizenship was reserved only for "free white person[s]" and changed the requirement in the 1790 Act of "good character" to read "good moral character". The Naturalization Act of 1798 increased the period necessary for immigrants to become naturalized citizens in the United States from 5 to 14 years. There is an asymmetry in the way citizenship status of children born overseas to unmarried parents, only one of whom is a U.S. citizen, is handled. Title 8 U.S.C. § 1409 paragraph (c) provides that children born abroad after December 24, 1952 to unmarried American mothers are U.S. citizens, as long as the mother has lived in the U.S. for a continuous period of at least one year at any time prior to the birth. 8 U.S.C. § 1409 paragraph (a) provides that acknowledgment of paternity can be shown by acknowledging paternity under oath and in writing; having the issue adjudicated by a court; or having the child otherwise "legitimated" by law. According to the Constitution of the United States only natural born citizens are eligible to serve as President of the United States or as Vice President. The text of the Constitution does not define what is meant by natural born: in particular it does not specify whether there is any distinction to be made between persons whose citizenship is based on jus sanguinis (parentage) and those whose citizenship is based on jus soli (birthplace). As a result, controversies have arisen over the eligibility of a number of candidates for the office. Throughout the history of the United States, the fundamental legal principle governing citizenship has been that birth within the United States grants U.S. citizenship; although enslaved persons and children of enslaved mothers, under the principle of partus sequitur ventrem, were excluded. The United States did not grant citizenship after the American Civil War to all former slaves until the passage of the Civil Rights Act of 1866, which was subsequently confirmed by the Fourteenth Amendment. American Indian tribal members are not covered specifically by the constitutional guarantee. Those living in tribes on reservations were generally not considered citizens until passage of the Indian Citizenship Act of 1924, although by that time nearly two-thirds of American Indians were already citizens. Birthright citizenship, as with much United States law, has its roots in English common law. Calvin's Case, 77 Eng. Rep. 377 (1608),  was particularly important as it established that, under English common law, "a person's status was vested at birth, and based upon place of birth—a person born within the king's dominion owed allegiance to the sovereign, and in turn, was entitled to the king's protection." This same principle was accepted by the United States as being "ancient and fundamental", i.e., well-established common law, as stated by the Supreme Court in 1898: "the Fourteenth Amendment affirms the ancient and fundamental rule of citizenship by birth within the territory, in the allegiance and under the protection of the country, including all children here born of resident aliens, with the exceptions or qualifications (as old as the rule itself) of children of foreign sovereigns or their ministers, or born on foreign public ships, or of enemies within and during a hostile occupation of part of our territory, and with the single additional exception of children of members of the Indian tribes owing direct allegiance to their several tribes." United States v. Wong Kim Ark, 169 U.S. 649 (1898). ... our constitution, in speaking of natural born citizens, uses no affirmative language to make them such, but only recognizes and reaffirms the universal principle, common to all nations, and as old as political society, that the people born in a country do constitute the nation, and, as individuals, are natural members of the body politic. The Indian Citizenship Act of 1924  provided "That all noncitizen Indians born within the territorial limits of the United States be, and they are hereby, declared to be citizens of the United States". This same provision (slightly reworded) is contained in present-day law as section 301(b) of the Immigration and Nationality Act of 1965 (8 USC 1401(b)). Nothing is better settled at the common law than the doctrine that the children even of aliens born in a country while the parents are resident there under the protection of the government and owing a temporary allegiance thereto are subjects by birth. Thus, Native Americans who voluntarily quit their tribes would not automatically become U.S. citizens. Native Americans were granted U.S. citizenship by Congress half a century later in the Indian Citizenship Act of 1924, which rendered the Elk decision obsolete. the Fourteenth Amendment affirms the ancient and fundamental rule of citizenship by birth within the territory, in the allegiance and under the protection of the country, including all children here born of resident aliens, with the exceptions or qualifications (as old as the rule itself) of children of foreign sovereigns or their ministers, or born on foreign public ships, or of enemies within and during a hostile occupation of part of our territory, and with the single additional exception of children of members of the Indian tribes owing direct allegiance to their several tribes. The Amendment, in clear words and in manifest intent, includes the children born, within the territory of the United States, of all other persons, of whatever race or color, domiciled within the United States. Every citizen or subject of another country, while domiciled here, is within the allegiance and the protection, and consequently subject to the jurisdiction, of the United States. His allegiance to the United States is direct and immediate, and, although but local and temporary, continuing only so long as he remains within our territory, is yet, in the words of Lord Coke in Calvin's Case, 7 Rep. 6a, "strong enough to make a natural subject, for if he hath issue here, that issue is a natural-born subject;" and his child, as said by Mr. Binney in his essay before quoted, "if born in the country, is as much a citizen as the natural-born child of a citizen, and by operation of the same principle." Bills have been introduced from time to time in Congress which have sought to declare American-born children of foreign nationals not to be "subject to the jurisdiction of the United States", and thus not entitled to citizenship via the 14th Amendment, unless at least one parent was an American citizen or a lawful permanent resident. Both Democrats and Republicans have introduced legislation aimed at narrowing the application of the Citizenship Clause. In 1993, Sen. Harry Reid (D-Nev.) introduced legislation that would limit birthright citizenship to the children of U.S. citizens and legally resident aliens, and similar bills have been introduced by other legislators in every Congress since. For example, U.S. Representative Nathan Deal, a Republican from the State of Georgia, introduced the " Citizenship Reform Act of 2005" (H.R. 698) in the 109th Congress,  the "Birthright Citizenship Act of 2007" (H.R. 1940)  in the 110th Congress, and the "Birthright Citizenship Act of 2009" (H.R. 1868)  in the 111th Congress. However, neither these nor any similar bill has ever been passed by Congress. Some legislators, unsure whether such Acts of Congress would survive court challenges, have proposed that the Citizenship Clause be changed through a constitutional amendment. Senate Joint Resolution 6, introduced on January 16, 2009 in the 111th Congress, proposes such an amendment;  however, neither this, nor any other proposed amendment, has yet been approved by Congress for ratification by the states. ^ See 8 U.S.C. § 1101(a)(36) (defining "State") and 8 U.S.C. § 1101(a)(38) (defining "United States"). ^ Weiner 1998, p. 238. ^ Smith, Rogers M. (2009). "Birthright Citizenship and the Fourteenth Amendment in 1868 and 2008". University of Pennsylvania Journal of Constitutional Law. 11 (5): 1329–1336. ^ Max Ehrenfreund (August 17, 2015). "Understanding Trump's plan to end citizenship for undocumented immigrants' kids". Washington Post. ^ "Number of babies born to unauthorized immigrants in U.S. continues to decline". Pew Research Center. Retrieved October 30, 2018. ^ "INA: Act 302 – Persons Born in Puerto Rico". U.S. Citizenship and Immigration Services. Retrieved October 19, 2012. ^ "8 Fam 301.1 (U) Acquisition by Birth in the United States". US Department of State. June 27, 2018. ^ Immigration and Nationality Act § 301(g); 8 USC § 1401(g). For children born prior to the enactment of Public Law 99-653 on November 14, 1986, the citizen parent's U.S. presence requirement is ten years, of which at least five years had to have been after the parent's fourteenth birthday. ^ a b Nguyen v. INS, 533 U.S. 53 (2001) Cornell University Law School. ^ Under a fact situation similar to Nguyen, the effect might be different today if the child's 18th birthday were after February 27, 2001, as per the Child Citizenship Act of 2000, the child might automatically become a U.S. citizen upon admission to the country as a lawful permanent resident. This type of citizenship, however, is not considered "birthright" or natural, and the subject would most likely be construed as a "naturalized" citizen. See the U.S. Department of State's page on the Child Citizenship Act of 2000. ^ Walter Dellinger, Assistant Attorney General (December 13, 1995), "Legislation denying citizenship at birth to certain children born in the United States", Memoranda and Opinions, Office of Legal Counsel, U.S. Department of Justice, archived from the original on July 25, 2009, retrieved January 4, 2007, A bill that would deny citizenship to children born in the United States to certain classes of alien parents is unconstitutional on its face. A constitutional amendment to restrict birthright citizenship, although not technically unlawful, would flatly contradict the Nation's constitutional history and constitutional traditions. .
^ Price, Polly J. (1997). "Natural Law and Birthright Citizenship in Calvin's Case (1608)". Yale Journal of Law and the Humanities. 9. ^ Justice, Elaine (October 7, 1996), "Price questions whether birthright citizenship will continue", Emory Report, retrieved January 4, 2007 . ^ The American Law Register. D.B. Canfield & Co. 1864. p. 599. ^ Howard, Benjamin C. (1857). A Report of the Decision of the Supreme Court of the United States and the Opinions of the Judges Thereof, in the Case of Dred Scott Versus John F. A. Sandford. December Term, 1856. New York: D. Appleton & Company. pp. 576–582. .
^ Bates, Edward (1862). Opinion of Attorney General Bates on Citizenship. Washington, D.C.: Government Printing Office. pp. 26–27. OCLC 252308921. ^ Bates, Edward (1862). Opinion of Attorney General Bates on Citizenship. Washington, D.C.: Government Printing Office. p. 12. OCLC 252308921. ^ "The 1866 Civil Rights Act". 14 Stat. 27–30. April 9, 1866. Retrieved January 7, 2016. ^ Expatriation Act, 14th-amendment.com , quoting Sanger 1869, pp. 223–224. ^ Snow (1893), Cases and Opinions on International Law, p. 218. ^ Transcript, Testimony of Edward J. Erler before the House Subcommittee on Immigration and Claims, June 25, 1997. ^ Thomas 2007, pp. 193–194. ^ 14 U.S. Attorney General Opinions 300. ^ Opinions of the Executive Departments on Expatriation, Naturalization and Allegiance (1873) 17, 18; U.S. Foreign Relations, 1873–74, pp. 1191, 1192. ^ 43 United States Statutes at Large 253. ^ Inglis v. Trustees of Sailor's Snug Harbor, 28 U.S. 99 (1830), U.S. Supreme Court Center, justia.com. ^ 83 U.S. at 73. ^ 112 U.S. at 102. ^ "Some Canadian mothers forced to give birth in U.S." KOMO TV News. October 3, 2007. Retrieved July 22, 2016. ^ "Challenges for Campobello Island: A crossing to bear". July 2012. ^ Congressional Globe, 1st Session, 39th Congress, pt. 4, pp. 2891–2. During the debate on the Amendment, Senator John Conness of California declared, "The proposition before us, I will say, Mr. President, relates simply in that respect to the children begotten of Chinese parents in California, and it is proposed to declare that they shall be citizens. 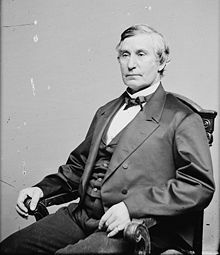 We have declared that by law [the Civil Rights Act]; now it is proposed to incorporate that same provision in the fundamental instrument of the nation. I am in favor of doing so. I voted for the proposition to declare that the children of all parentage, whatever, born in California, should be regarded and treated as citizens of the United States, entitled to equal Civil Rights with other citizens." ^ Congressional Globe, 1st Session, 39th Congress, pt. 4, pp. 2890, 2892–4, 2896. ^ Congressional Globe, 1st Session, 39th Congress, pt. 4, p. 2893. Senate Judiciary Committee Chairman Lyman Trumbull, participating in the debate, stated the following: "What do we [the committee reporting the clause] mean by 'subject to the jurisdiction of the United States'? Not owing allegiance to anybody else. That is what it means." He then proceeded to expound upon what he meant by "complete jurisdiction": "Can you sue a Navajoe Indian in court? ... We make treaties with them, and therefore they are not subject to our jurisdiction ... If we want to control the Navajoes, or any other Indians of which the Senator from Wisconsin has spoken, how do we do it? Do we pass a law to control them? Are they subject to our jurisdiction in that sense? ... Would he [Sen. Doolittle] think of punishing them for instituting among themselves their own tribal regulations? Does the Government of the United States pretend to take jurisdiction of murders and robberies and other crimes committed by one Indian upon another? ... It is only those persons who come completely within our jurisdiction, who are subject to our laws, that we think of making citizens." ^ Congressional Globe, 1st Session, 39th Congress, pt. 4, p. 2895. Howard additionally stated the word jurisdiction meant "the same jurisdiction in extent and quality as applies to every citizen of the United States now" and that the United States possessed a "full and complete jurisdiction" over the person described in the amendment. ^ Erler et al., The Founders on Citizenship and Immigration: Principles and Challenges in America, p. 67. ^ Rosen, Jeffrey, host. "Does the Constitution Require Birthright Citizenship?" We the People, National Constitution Center, November 8, 2018. ^ Angelo N. Ancheta, Race, Rights, and the Asian American Experience, p. 103. ^ Simmons, Kathryn. "Anchor babies tie illegal immigrants to U.S." NBC2 News. November 25, 2005. ^ Erbe, Bonnie. " Anchor Babies hurt working class." Seattle Times. May 18, 2005. ^ Daniel González and Dan Nowicki. " Birthright citizenship change would have wide effects." Arizona Republic, March 20, 2011. ^ a b Jon Feere, " Birthright Citizenship in the United States: A Global Comparison." Center for Immigration Studies. ^ Citizenship Reform Act of 2005. ^ Birthright Citizenship Act of 2007. ^ Birthright Citizenship Act of 2009. ^ U.S. Representative Anthony Beilenson (D-CA). " Case for Correction By Constitutional Amendment." The Social Contract. Volume 7, Number 1 (Fall 1996). All Senate debate quotes are from the Congressional Globe (precursor of the Congressional Record) for the 39th Congress, 1st Session. pp. 2890–95. Erler, Edward J. (2003), "From Subjects to citizens: The Social Origins of American Citizenship", in Pestritto, Ronald J., The American Founding and the Social Compact (illustrated ed. ), Lexington Books, ISBN 978-0-7391-0665-5 . Erler, Edward J.; West, Thomas G.; Marini, John A (2007), The Founders on Citizenship and Immigration: Principles and Challenges in America, Lanham, MD: Rowman & Littlefield, ISBN 978-0-7425-5855-7 . Mayton, William T. (2008). "Birthright Citizenship and the Civic Minimum". Georgetown Immigration Law Journal. 22 (221). Sanger, George P., ed. (1869), Statutes at Large and Proclamations, of the United States of America. From December 1867 – March 1869, Boston: Little, Brown, and Company . Schuck, Peter H. (2006), Diversity in America: Keeping Government at a Safe Distance, Harvard University Press, ISBN 978-0-674-01854-9 . Thomas, Brook (2007), Civic Myths: A Law-and-literature Approach to Citizenship (illustrated ed. ), UNC Press, ISBN 978-0-8078-3153-3 . Weiner, Myron (1998), Migration and Refugees: in the United States and Germany, Providence, RI: Berghahn Books, ISBN 978-1-57181-091-5 . Ancheta, Angelo N. (1998), Race, Rights, and the Asian American Experience, Brunswick, NJ: Rutgers University Press, ISBN 978-0-8135-2464-1 . Carlisle, Rodney P.; Golson, J. Geoffrey (2007), A House Divided During the Civil War Era (illustrated ed. ), ABC-CLIO, ISBN 978-1-85109-881-1 . Meese, Edwin III; David F. Forte; Matthew Spalding (2005), The Heritage Guide to the Constitution, Regnery Publishing, ISBN 978-1-59698-001-3 . Ridgell, Reilly (1995), Pacific Nations and Territories: The Islands of Micronesia, Melanesia, and Polynesia, Bess Press, ISBN 978-1-57306-001-1 . Streichler, Stuart (2005), Justice Curtis in the Civil War Era, ISBN 978-0-8139-2342-0 .